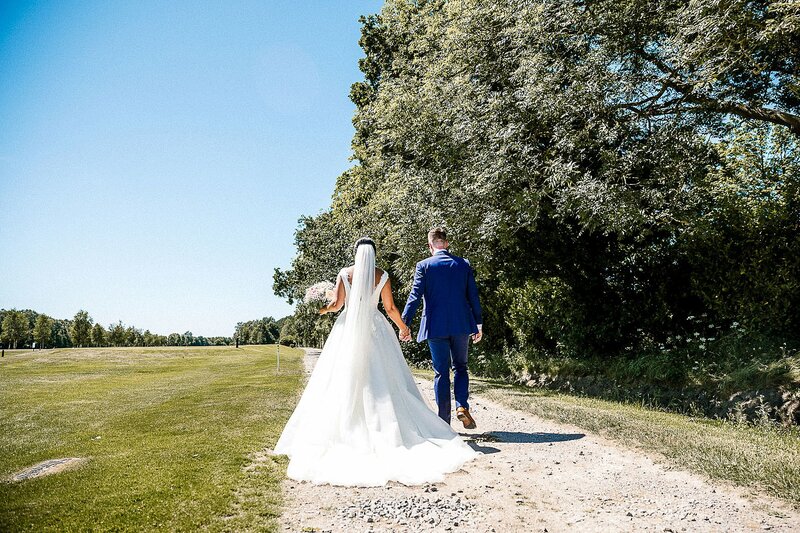 Today’s newlyweds Nicola and Robert got married last summer at the beautiful Sandburn Hall in York, set amidst picture-perfect lakes and woodland. Describing the venue as a blank canvas, the couple loved having free reign over the design and styling of the space. And boy, did they do it justice! The venue was every inch the perfect wedding day setting, with plenty of decorative touches in keeping with the couple’s rustic theme. We’re talking log slices, wreaths, candleholders, confetti and our favourite – fairy lights! Roses, gypsophila, eucalyptus and hessian further accentuate those country charm feels. And for those of you courting the idea of an all-out princess style gown (and why not, we say?) 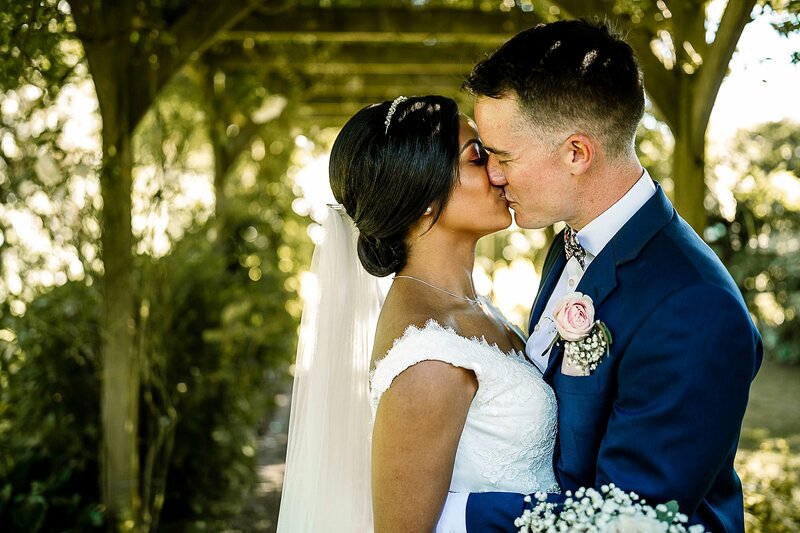 then Nicola’s gorgeous Pronovias gown will give you a serious dose of wedding dress envy – scroll down for all the fabulous pics! Nicola says: Robert surprised me with a trip to Rome at the beginning of December 2017. It’s somewhere I have always wanted to go, for the sightseeing and amazing food. Robert arranged the most perfect day of sightseeing. He even timed it perfectly so we arrived at Aventine Hill at sunset, where he got down on one knee. It was what dreams are made of. We got married on 22nd June 2018. We both loved the idea of a summer wedding. We got married at Sandburn Hall, York and held both the ceremony and reception there. It was the only venue we went to see and we immediately knew it was the one. The main function hall had a vintage, rustic feel, but at the same time was a blank canvas, which allowed us to plan and design everything. The main window in the hall looked out across the grounds of the venue; it was just stunning. 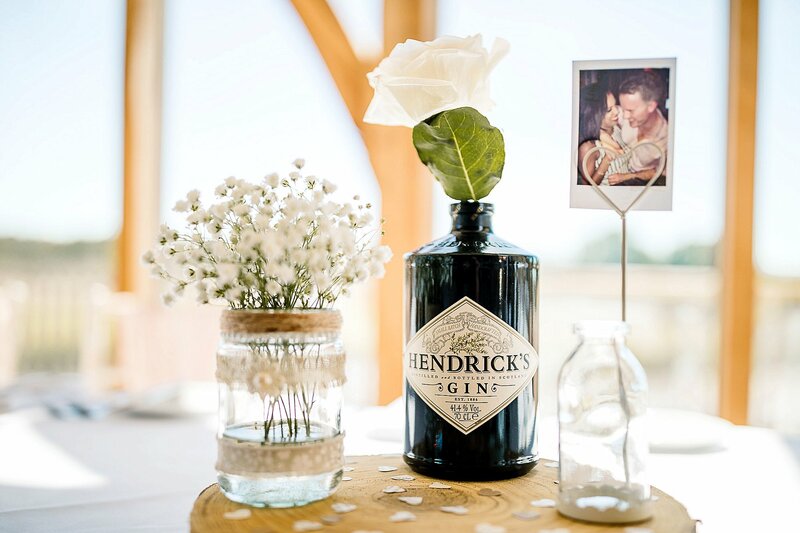 We chose a vintage and rustic theme for our wedding, and also named all our tables after our favourite gins. We made our seating plan and centre pieces using the chosen gin bottles and then added flowers and candles. We chose dusky pink as our colour scheme. It suited all our beautiful bridesmaids perfectly. Robert’s suit was an indigo colour so the pink complimented that really well too. It was the perfect choice for the summer season. I chose a princess style dress by Pronovias – the complete opposite of what I ever thought I’d go for (which my mum loved)! I purchased it from Confetti and Lace in Leeds. I went shopping with my mum and it was the first shop we visited, and I knew before it was fastened that it was the one. It was just stunning. So elegant and classy and I felt amazing in it. I added some sparkle with a simple, thin belt and a floor length veil. Robert wore a two-piece suit from Charles Tyrwhitt. He also bought navy braces from the same store, a floral dicky bow from Next and brown brogues from River Island. He looked very handsome! The groomsmen all wore three-piece suits from Slaters and pink ties and pocket squares from Next. 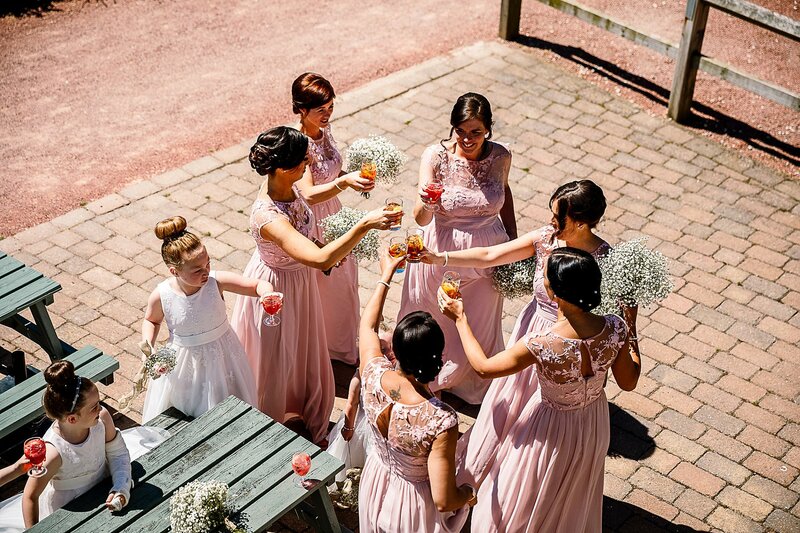 The bridesmaids all had dresses from high street brand Lipsy, which were pink chiffon with stunning lace detail on the neck and chest. They all looked beautiful! The flower girls all wore Rocha John Rocha flower girl dresses from Debenhams. All hair was done by my incredible hairdresser Joe O’Nions (Hair by Joe) and my makeup was done by Bethan Victoria Makeup Artist. The bridal party and I stayed close to the venue the night before the wedding, at the beautiful, cosy Claxton Hall Cottage. We had the whole place to ourselves and had such a relaxed evening. My brother-in-law transported me and my mum in his Audi Q7 to the ceremony. Our photographer was Hayley Baxter and what a talent and incredible woman she is! She captured our day so naturally, yet so perfectly. She wasn’t just a photographer for us, she was a massive support on the day and a ray of sunshine! She even helped me into my dress! One of the main reasons we chose Hayley was because of her natural shots. We hardly recognised she was there on the day so we were blown away by the shots she captured. Hayley Baxter recommended the incredible talent that was Tom Harrington Films. 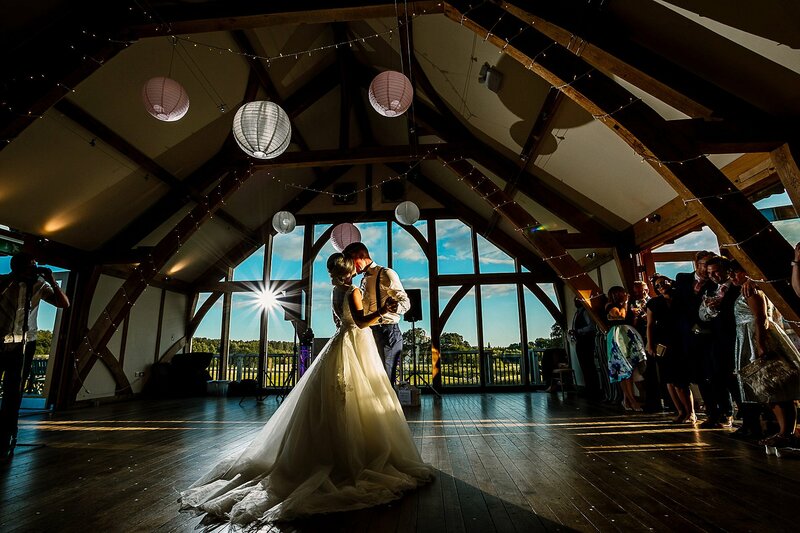 We were unsure whether to have a videographer at first, but when we watched his videos, we were sold! Again, we hardly knew he was there and the video we have is absolutely incredible – we’re still not bored of watching it! My bouquet was a mix of roses, gypsophila and eucalyptus. It was stunning and smelt amazing. All the bridesmaids had gypsophila bouquets, our daughters had wands with hessian bows and my mum had a corsage on her wrist. These were all provided by Laura Head from Love Blossoms Flowers. She was so lovely and knew straight away what we wanted, and her prices were incredible. We did most of our decorations and centre pieces ourselves. Our table plan was a decorated stepladder. We also bought log slices, wreaths, candleholders and confetti from Country Baskets, Leeds. We got a welcome sign from Ivy Cottage Homeware on Etsy too. The venue set it up beautifully for us. 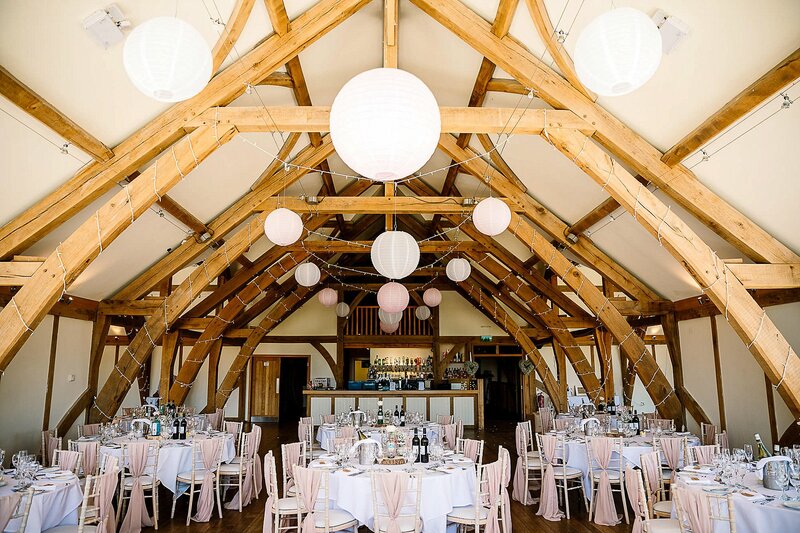 Wedding Venue Lighting decorated the hall with fairy lights and the ceiling lanterns, matching our colour scheme perfectly. Shindig Event Styling also provided us with beautiful chiffon drops for our chairs. They were so classy, adding such an elegant touch to the décor. We chose a three-tiered naked cake from Cake Bakes in Castleford, with buttercream, topped and decorated with various summer berries. It was beyond beautiful and tasted just as good! We served this to our guests during the evening buffet. For starters, we had duck spring rolls with a bourbon sauce. This was followed by a main of chicken stuffed with garlic and mascarpone, wrapped in Parma ham, with chorizo and pine nut risotto and a mustard and tarragon sauce. To finish, we indulged in sticky toffee pudding and ice cream. We had a caricaturist for the afternoon and first part of the evening reception, and this was popular with the guests. Quite a few managed to have a sketch done, including our photographer and videographer! For the evening reception we hired Club Class Entertainment for our DJ and lighting. They were recommended by the venue and provided a great variety of music for everyone. 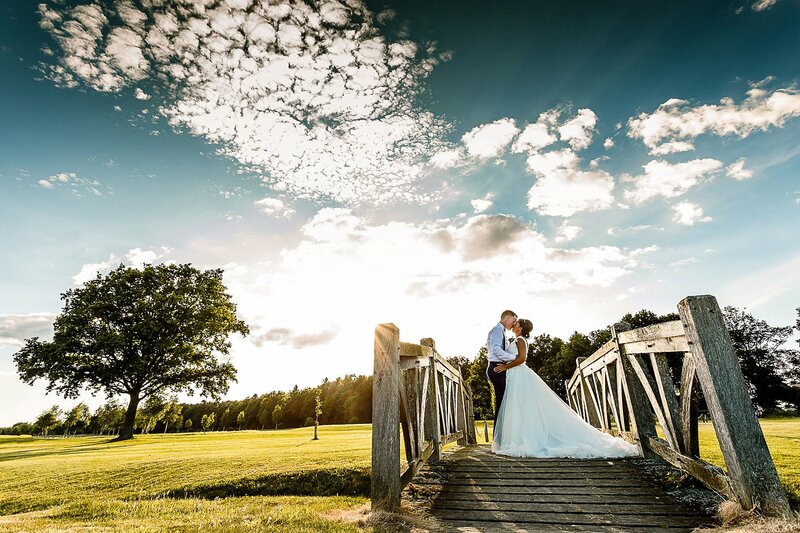 Sandburn Hall was the most perfect venue for us and we would recommend it to anyone. 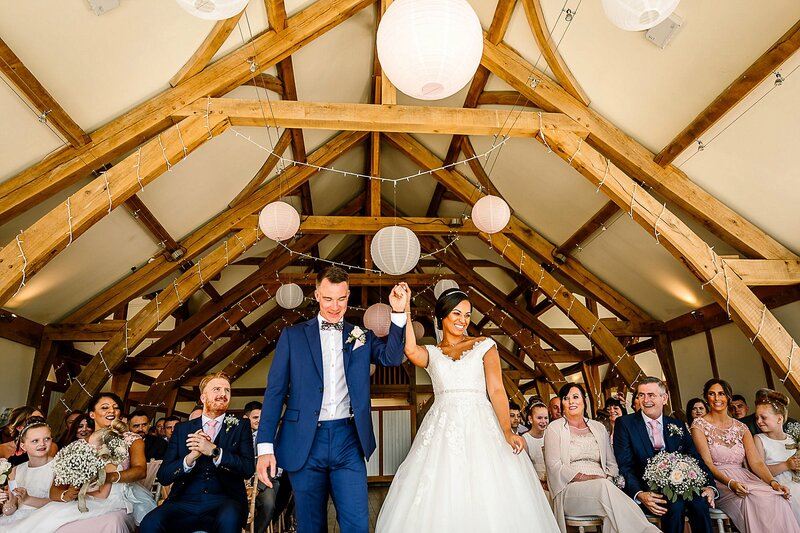 The staff were incredible – particularly Rhian, our wedding coordinator. She made sure everything was covered and went above and beyond leading up to and including the most important day of our lives. Every single guest commented on the beauty of the venue and how incredible the food was. My favourite part of the day was walking down the aisle to Robert and saying our vows. It felt like it was just the two of us in the room. It was also amazing having our closest friends and family all together in one room, celebrating our perfect day with us. We went to Morocco for a week, the month after our wedding. It was beautiful, and so lovely to explore the culture – the weather was incredible too! My advice for other Brides Up North planning their wedding is to make sure you do what you want to do. Weddings can be very political, especially when it comes to who to invite and the costs. But those who are happy for you, will support you and your choices. 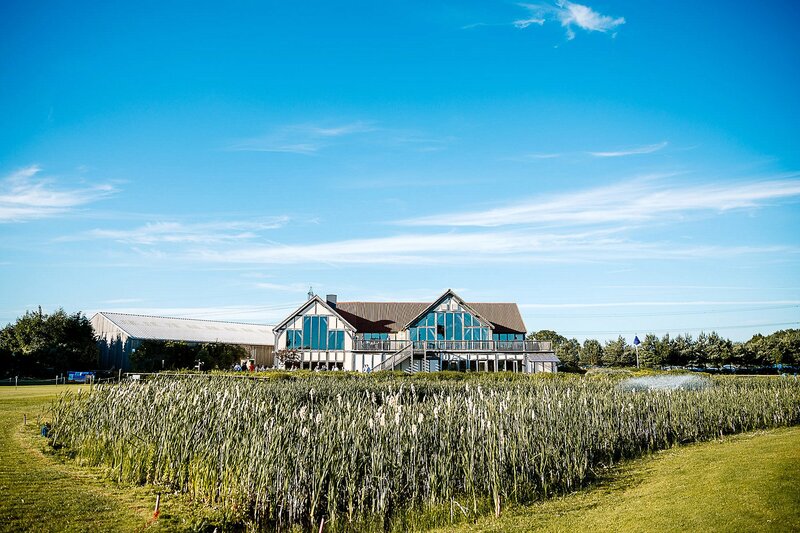 I used Brides Up North whilst planning our wedding when looking for inspiration of décor and flowers in particular. It was good to be able to recognise local venues and suppliers. I loved reading the real weddings sections and taking ideas from several of them and making them our own.